After your seeds have started, these easy-to-make newspaper pots are perfect for transplanting your new seedlings. Forget pricey plastic sets and excess pots----all you need is some extra newspaper and a small cup or mason jar and you are on your way. Since the newspaper will decompose naturally, you can then plant these right into the garden. 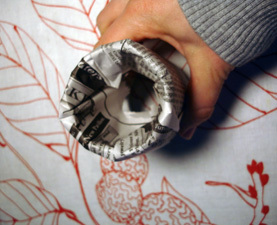 Cut sheets of black and white newspaper in half or thirds, depending on the size of pot you want to make. Make sure not to use pages with color, since this will be going directly into your garden. (Color newspapers may contain heavy metals that are unsafe). 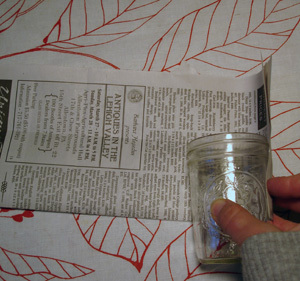 Align your mason jar or cup with the newspaper so that a few inches of paper are above the opening of the cup. Roll the newspaper so it circles the cup. Push the sides of the paper that are above the cup opening inside, so they are wrapped around the lip of the cup. Remove the cup gently, while still keeping the pot’s shape. 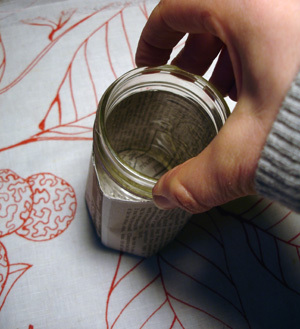 Use the bottom of the cup to reinforce the pot’s bottom by inserting it inside the newspaper pot. Tamp down the inverted ends, so it seals the bottom. Add soil and transplant or start your seedlings. When they reach the size for transplanting outside, they can be placed directly into your garden. This will also alleviate root disruption for healthy, happy seedlings!